Planning a trip to the rocky coasts and fern-draped inland of Brittany (known as Bretagne by locals)? Wondering what you should eat, where to find it, and how to discern quality? 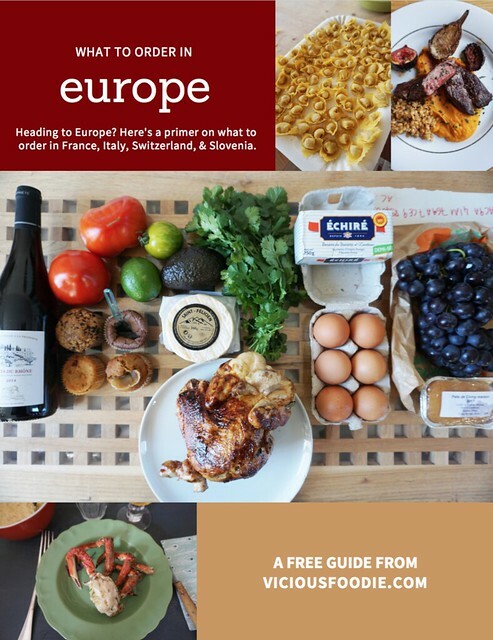 This little Brittany food guide has you covered. Based on a combination of personal experience (a fond hello to all the lovely salted caramels and galettes I’ve consumed! 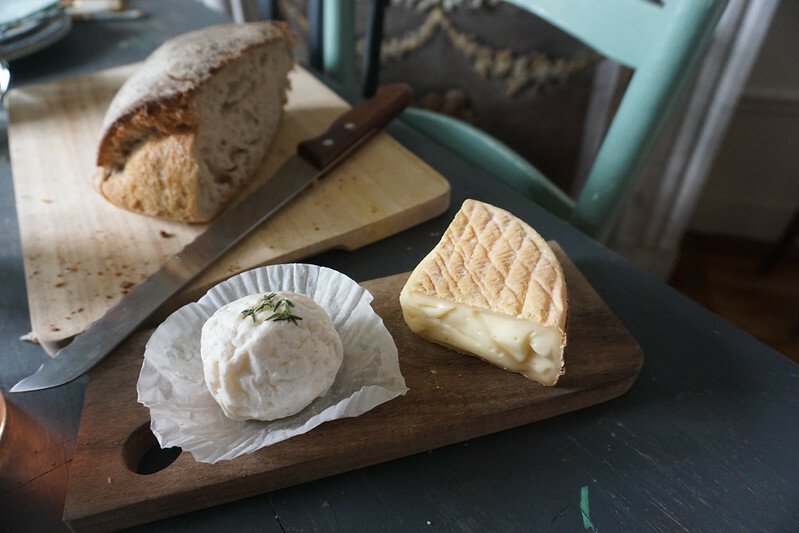 ), interviews with local foodies, and internet research on histories and current production practices, I hope this list of characteristic Breton food is a good starting point for your own research. Bon appetit! Let’s dive in. 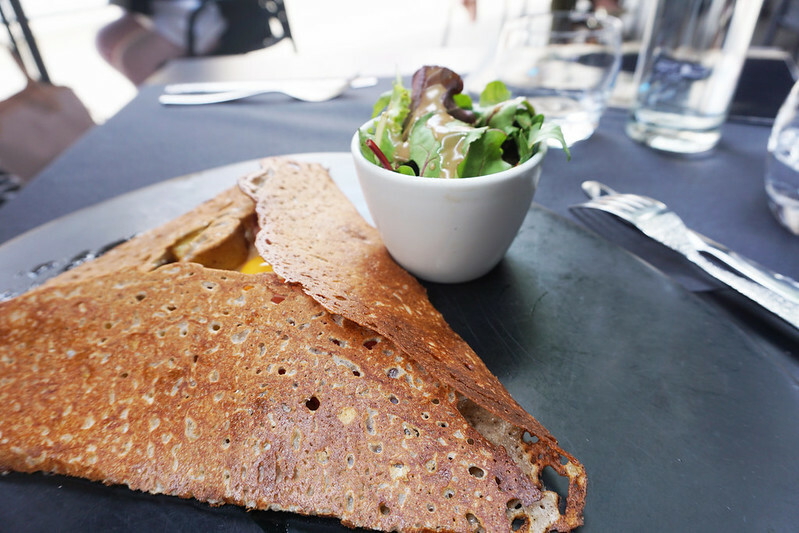 Brittany’s food scene is dominated by the galette – a buckwheat crepe served savory with fillings like eggs, ham, or veggies. You’ll also hear people call them Breton crêpes, though what we think of as crêpes are typically the galette’s sweeter cousin made with all-purpose flour. 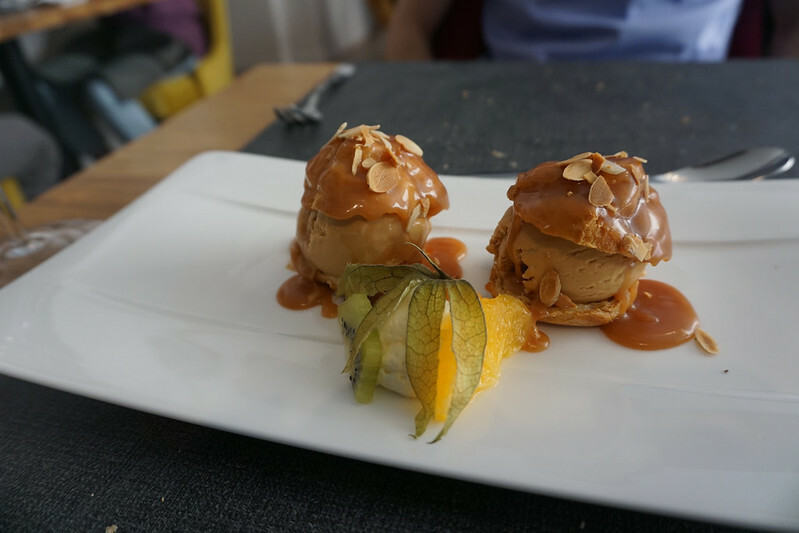 Travel through Brittany and you’ll find a number of variations on the galette. Sometimes they’re thin and crisp (as in the photo below) and sometimes thicker and spongy. Some contain eggs, others don’t. Some are 100% buckwheat. Some are partially buckwheat. It’s worth trying whatever the best local places serve up. Compare, contrast, and make your own call on which region serves up the best galettes. Grab a cool galette and wrap it around a hot, grilled pork sausage and you’ve got galette-saucisse. Traditionally, it’s eaten plain (no sauce), though some say Dijon mustard is an acceptable addition. According to one local, the best you’ll find in Brittany at the big fresh market in Rennes. The history here is one of (wait for it) taxes. Other parts of France paid taxes on salt and thus used it sparingly. Bretons did not and thus packed it into their butter (which better preserved the butter). For a taste of the best the region has to offer, head to La Fleur de Sel in Dinan or the Marché de Lices farmers market in Rennes. Soft in the center and crunchy on top, kouign-amann is a pastry designed to deliver enormous amounts of butter and sugar without tasting overly sweet. The authentic stuff looks simple: small circular cakes usually with a tight circular swirl visible at the top. 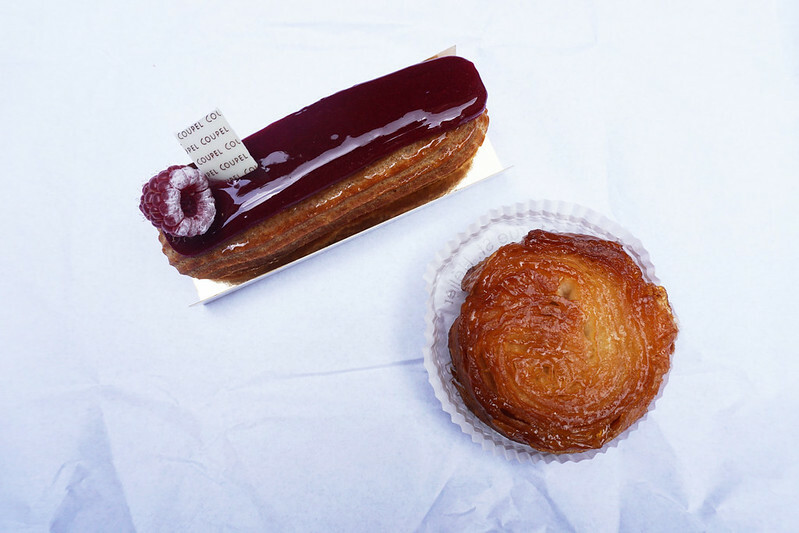 It tastes of caramel and salt and can be purchased in a variety of sizes from bakeries around Brittany (we particularly liked the version at Coupel in Rennes). In French: caramels au beurre salé. The authentic stuff is harder to find these days, so don’t just settle for anything. What you want is traditionally crafted caramels made from the famous salted butter, heavy cream, sugar, and sea salt (perhaps even the famous fleur de sel, which is harvested nearby). Food-loving Bretons I met also made a version of salted butter caramel at home with a focus on the butter and sugar elements of the dish. Harvested from local ponds, this crunchy French salt is the most expensive in the world. It’s known for its characteristic crunch and is considered a finishing salt. This means it’s used to season finished food – from salted caramel to tomatoes – not during the cooking process (when it would melt and taste just like any other salt). The cold coastal waters surrounding Brittany on three sides are prime habitat for lobster and crab. If you’re along the coast and notice fresh lobster or crab on the menu, it’s worth ordering. Local lobsters have black shells and blue highlights. Apple-based cidres (or ciders) are popular here in Brittany, sometimes served clear and sometimes cloudy and with an alcohol content generally ranging from 2 – 5%. Breton cidres are served sparkling in bottles reminiscent of Champagne and range from sweet to dry, similar to wine. To taste an authentic one, ask locals about their favorite table brand or the best local crêperie. Cidre is traditionally served with galettes. This popular coastal fish stew made with potatoes and a variety of fish and served over a fresh baguette. Historically, it was a fisherman’s dish – prepared by fishermen and their families. The more varieties of fish are in the dish, the better the quality. Or so believe the locals. And the key to a dish that truly shines is a cook who knows when to add each fish to the brew so they all cook evenly. Salt meadow lamb is a special type of lamb raised in salt marsh meadows like those found at Mont-Saint-Michel. The lambs come from Normandy, Brittany, and around the Somme. Their grazing pastures have high salt content, which gives them a distinctive flavor (and makes them a delicacy). The AOC and AOP-certified ones are always raised without growth hormones or antibiotics. Watch for them on menus between July and February (they go to market at a certain age), and expect them served rare (most French waiters won’t ask your preference; rare is considered the best way to serve them). If you see the word gallois at the end, that means the lamb was imported and is not a French product. This thick, fermented milk beverage is a common snack (or breakfast, as one Breton confessed). Its origins are similiar to buttermilk. It started out as a waste product from the butter-making process. Because it was cheap and probiotic- and protein-rich, locals started drinking it. And the evolution took off from there. Unlike tart, thin buttermilk, lait ribot is thick and pleasant. I’ve seen it described as a slightly sparkling drinkable yogurt by one writer, cheesy by another, and sweet by a local I interviewed for a story years ago. This dish of slow-simmered meats with a buckwheat flour pudding is a lesser-known French specialty from the Finistère region of Brittany. Some call the mixture dumpling-like. Others describe it as a pudding. Still others call it the Breton couscous. To make it, you need a special bag (which can be tricky to find, apparently), which you fill with a mixture of buckwheat flour, eggs, sugar, milk, salt, and butter and simmer in broth. Literally “Brittany butter cake,” this specialty for sweet toothed foodies everywhere (read: me) is served simple, circular, and unfrosted. It can be served plain or infused with a layer of jam in the center or a compote topping. And as a general rule of thumb, the better the butter quality, the better the cake. Now, to you: What have I missed? What other Breton specialties should have been mentioned?